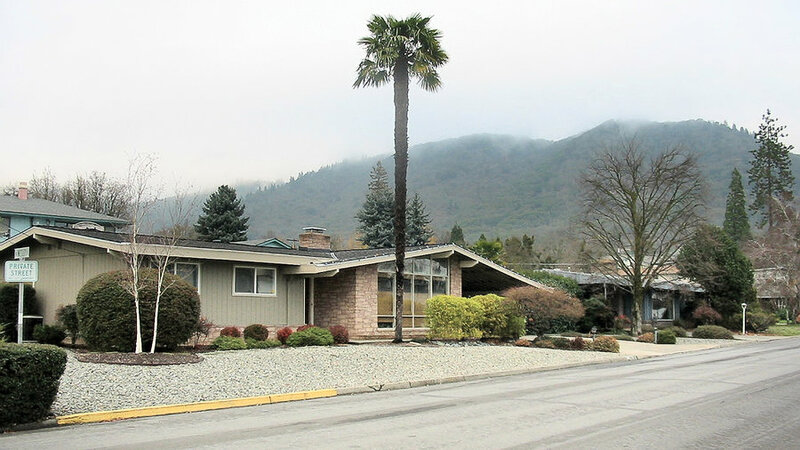 When University of California horticulturist Eric Schulz and his partner bought this home in 2008, the yard was a mess of bare soil and failing retaining walls. Although it “scared other buyers off,” says Schulz, he saw only potential. 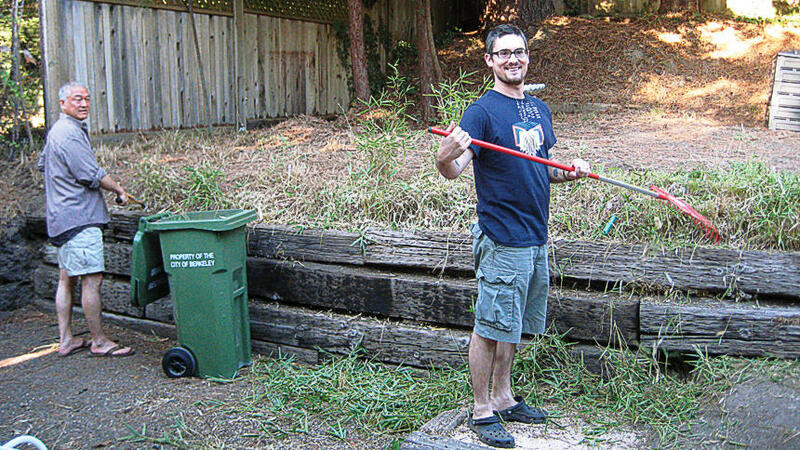 Eric Schulz discovered that even the smallest areas of his outdoor spaces could be put to work. The narrow spot outside of the sunroom could easily have been a “nothing space,” he says. But the sheltered pocket with seating is now the most fought-over spot between Schulz and his partner, Chris Groves, especially on chillier evenings when it’s protected from the wind. “It feels really private. I can still hear the music playing inside the house, but I’m very much surrounded by plants,” says Schulz. Half a year later, Smith and Rosenberger couldn’t be happier with the garden as it has grown in. “We sit in the living room and stare out the window in complete disbelief that this is ours,” says Smith. And when they open their water bill each month, they’re equally shocked: The amount hasn’t budged. 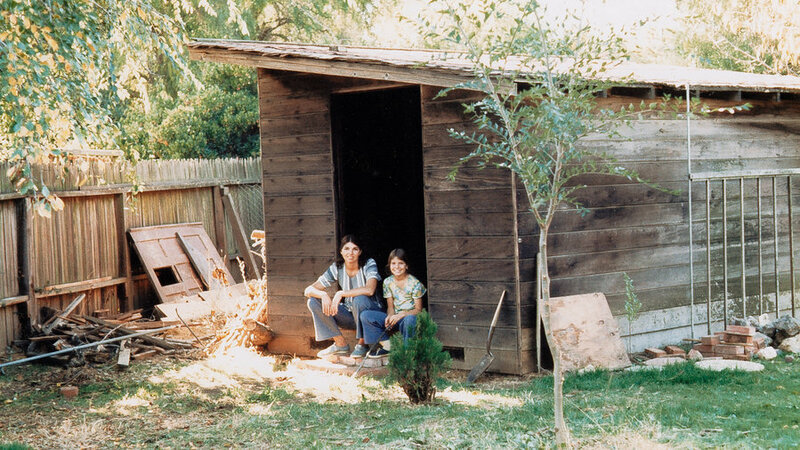 When garden designer Rebecca Sweet and her husband, Tom Urban, bought their property from her parents in 2000, their garden shed was run down. “It was nearly a man cave,” Sweet says. “I decided to take a stand against all that nonsense—ha!” Besides, she adds, she needed an office for her landscape-design business, Harmony in the Garden. 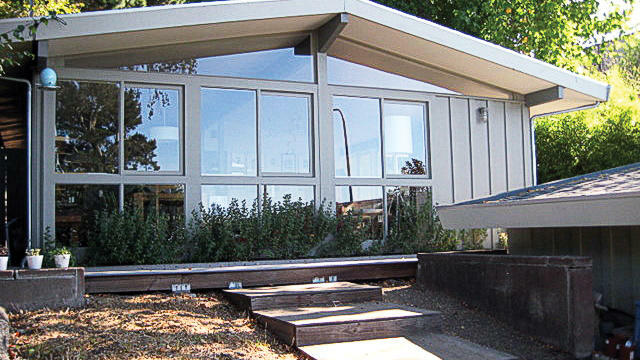 Together the couple converted the structure into the backyard retreat it is now. They pushed up the ceiling to create a peaked roof; installed skylights and recycled windows; hung window boxes on outside walls with planting beds beneath; and created an outdoor potting table and tool storage area behind the shed near the back fence. 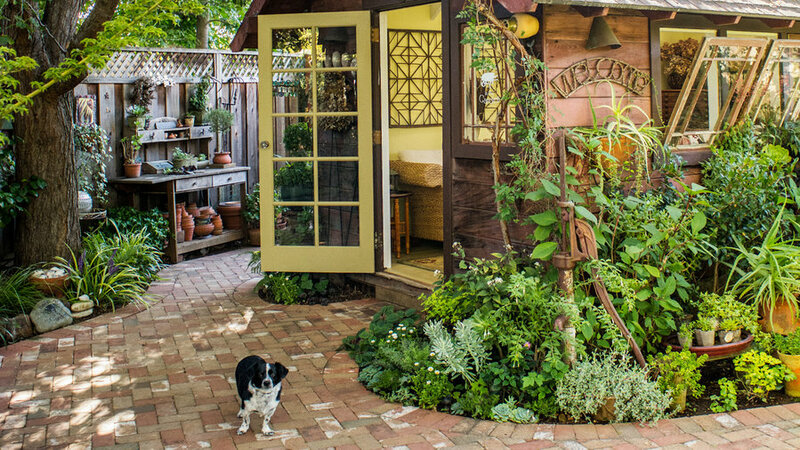 Through additional smart detailing, the former “man cave” has been transformed into a backyard "chick shack" where Sweet can be inspired and lounge with company. 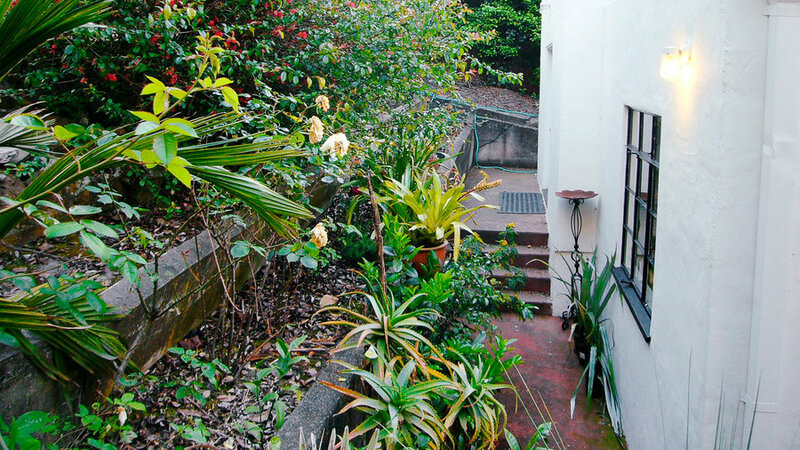 The house had no proper entryway—just three wooden steps—and almost no plants at all. 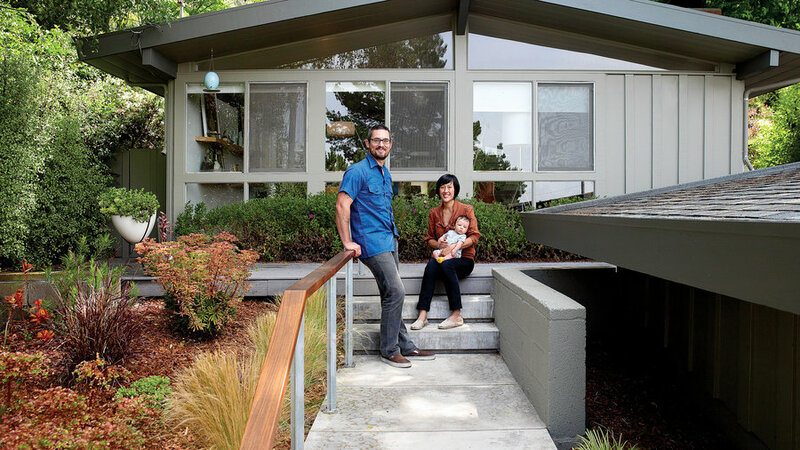 Traversed by a concrete stairway—that sleek handrail is ipe wood—the yard is now home to veggie beds, water-wise plants, and “endless mulch”—all of it built, planted, or spread by homeowners Lisa Wong Jackson and Nick Jackson. The re-landscaped DIY backyard now contains a patio for entertaining, a potting area, a raised bed for vegetables and herbs, a patch of Eco-Lawn, loads of native and low-water plants, and the house’s old mailbox (now a bird feeder). 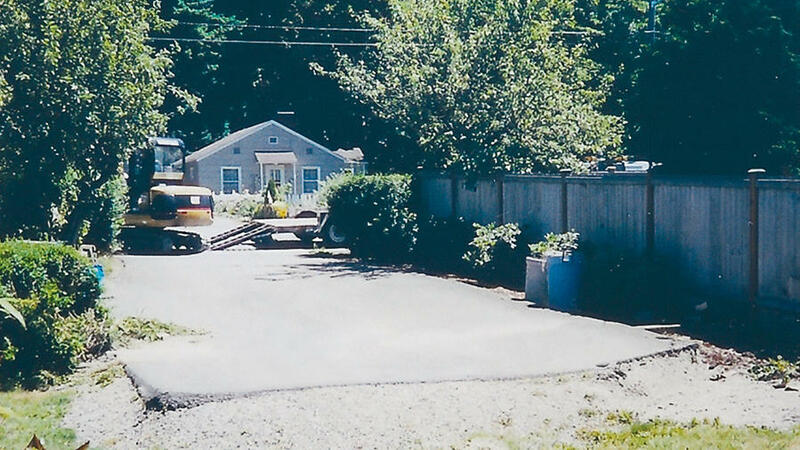 Covered with decomposed granite and sloping awkwardly toward the rear of the property, this small backyard was no place for a party. 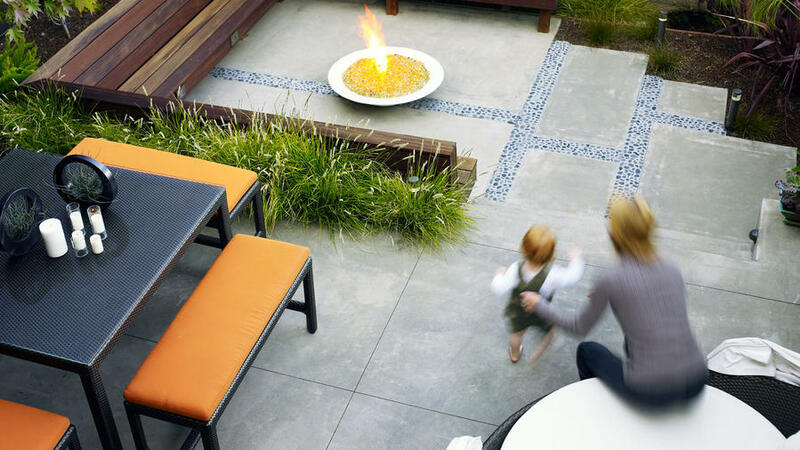 Owners Susan and Warren Byrne love to entertain, though, so landscape architect Jude Hellewell and landscape designer Laura White created a split-level living space complete with built-in seating and a peekaboo fence. 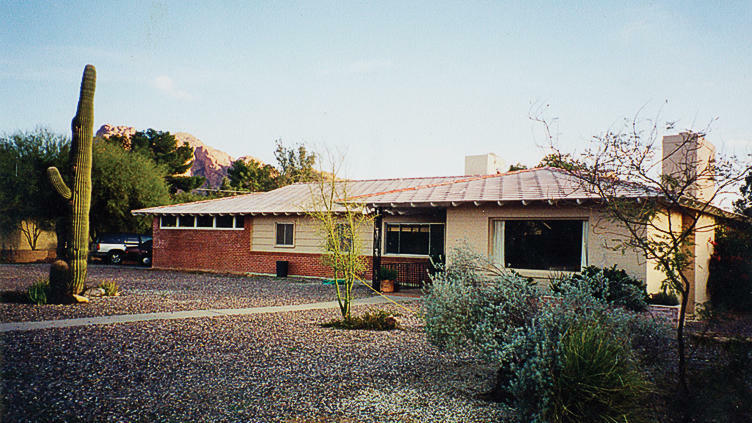 The gravel was replaced with two levels of colored concrete. 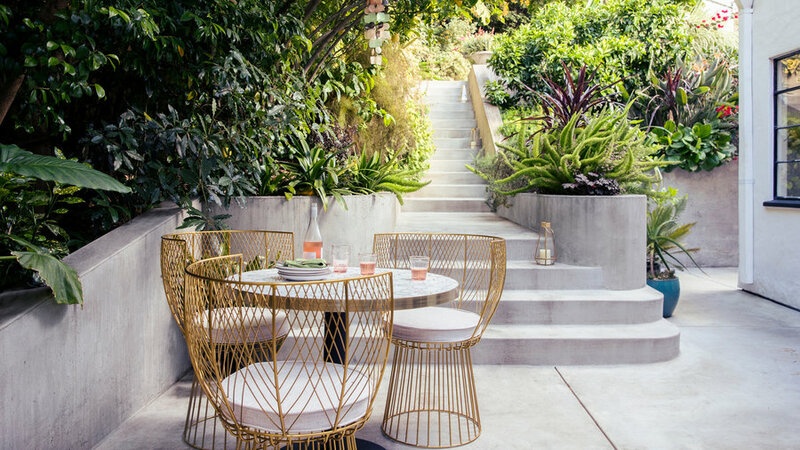 The Byrnes use the upper terrace mostly for dining and hanging out; three steps down, a built-in bench invites guests to lounge around the firepit. 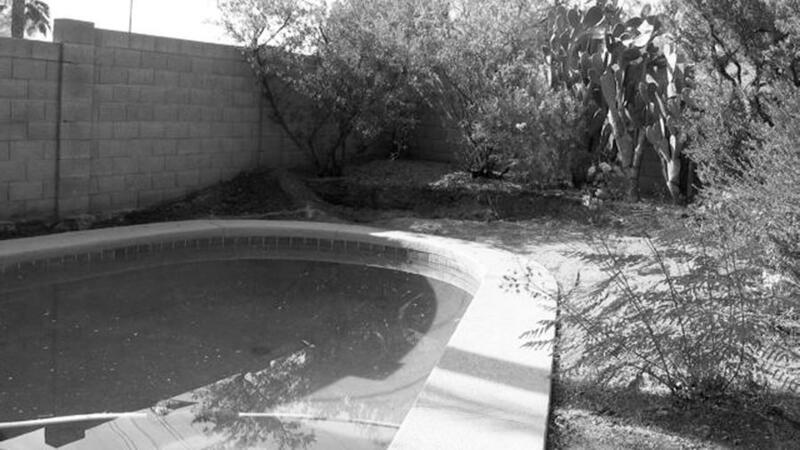 Surrounded by bleak concrete blocks, the pool in Mary and Paul Schweikher’s backyard felt hemmed in. Designer Christy Ten Eyck transformed the space with a new rock wall, raised planters, sculptural planters, and less-severe paving. 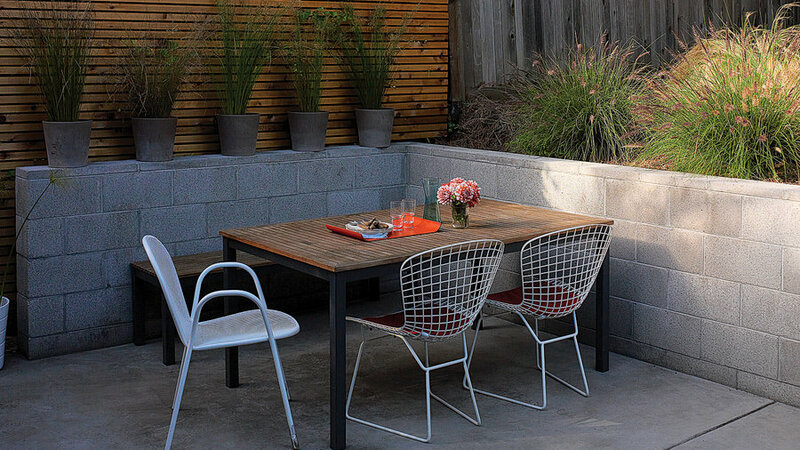 Now, backed by the enveloping curves of a stone-filled wire-mesh wall, this part of the yard feels cozy. The new rock wall was installed in front of the old wall. 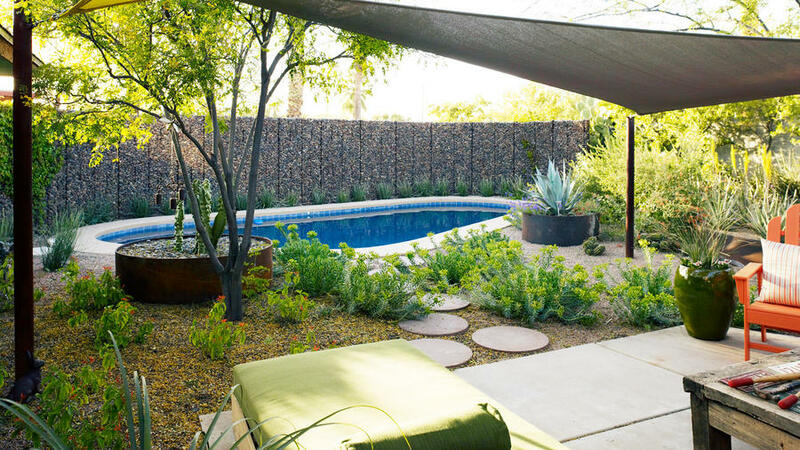 The space created between the two conceals pool equipment and a new outdoor shower. Yellow and gray shade sails overhead provide much-needed respite from sun, and raised planting beds, made of steel, balance the heft and drama of the river-rock wall. 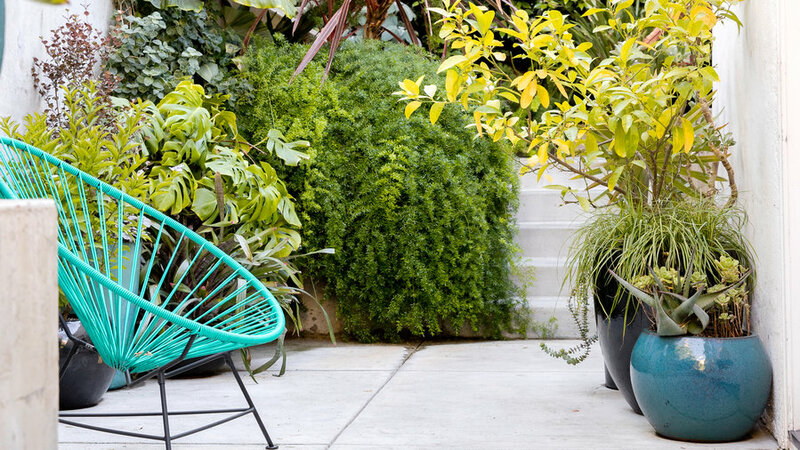 A generous sprinkling of lush plants adds softness. Because of the intense sun, these plants were chosen for endurance as much as beauty: yellow-flowered Euphorbia rigida, verbena, and, along the wall, candelilla. 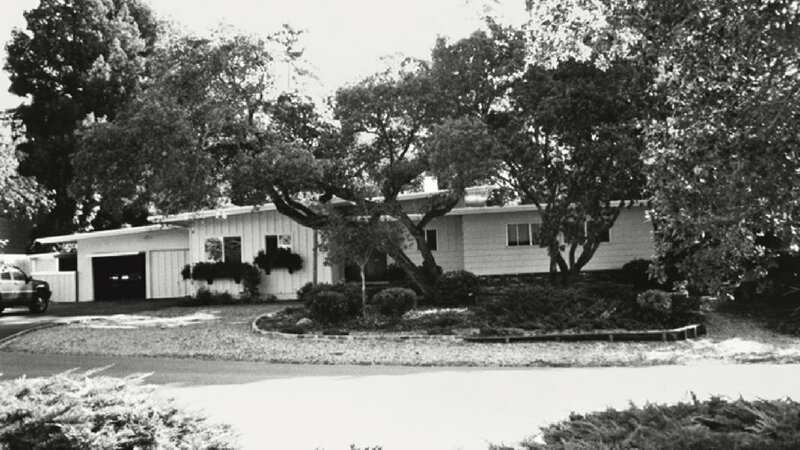 The only way to get to the front door of Ginny Mellinger’s house in Redwood City was to cross the driveway or lawn. Even though—or because—the space was wide open to the street, it was useless. 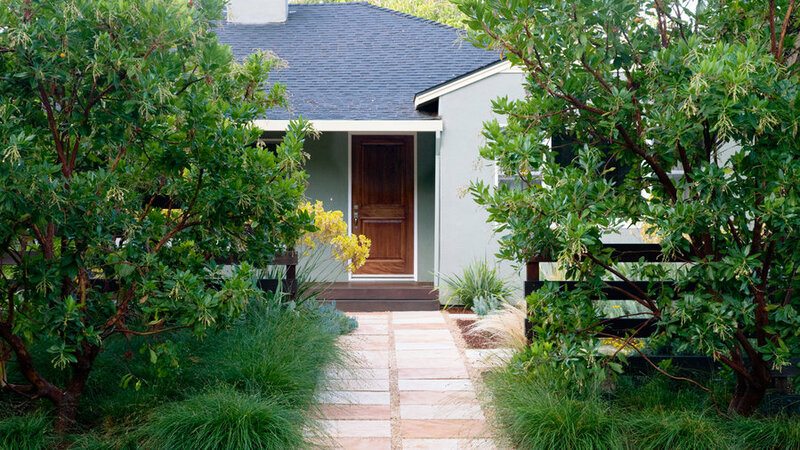 A new fence, a path, and the understated plantings that replaced the lawn add huge curb appeal. The beauty of Ginny Mellinger’s new front garden is that the plants look good all year with minimal care. It now has two parts—a public one and a more private one—separated by fencing. In the woodsy “public” section, shapely Arbutus ‘Marina’ trees are underplanted with mounded deep green Carex tumulicola, which spills onto the entry path in a haze of fine, soft leaves. 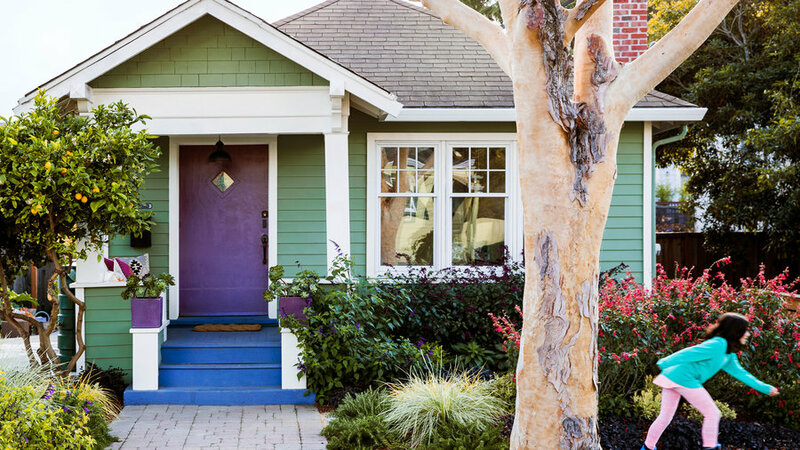 Closer to the house, scattered around the patio, an exuberant mix of plants adds some color—yellows, blues, and deep plum-chocolate. 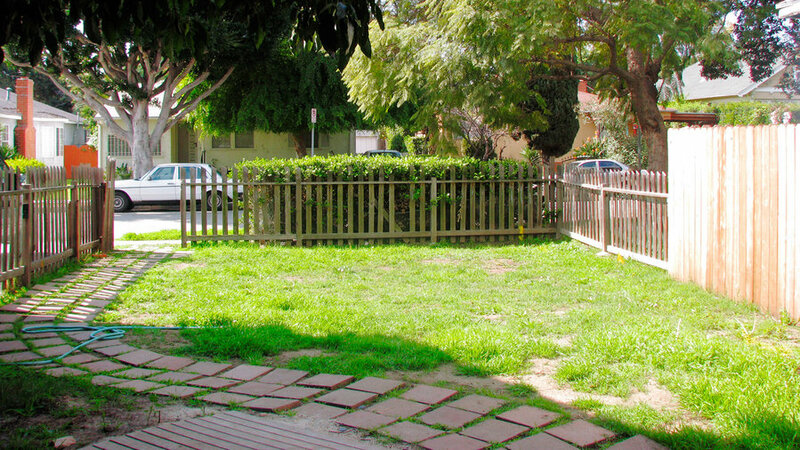 With its scraggly lawn and rickety fence, this yard looked neglected. 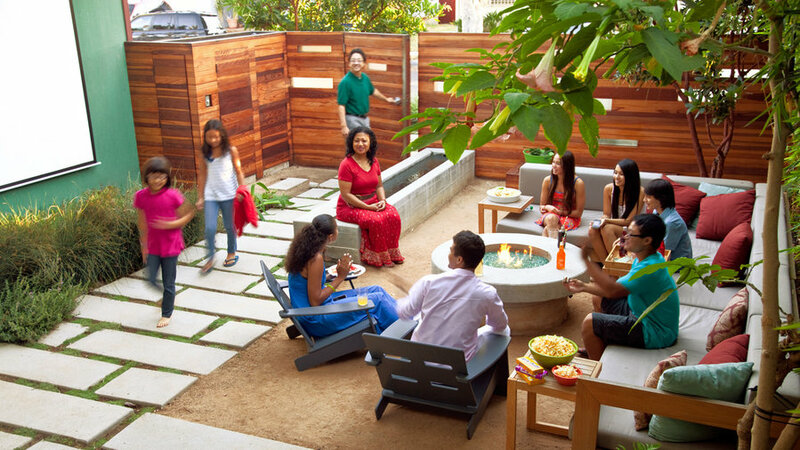 With the help of landscape designer Mark Tessier, Rika Houston and her architect husband Brian Ten overhauled their yard to create a gathering spot for the family, which includes 9-year-old daughter Maya and teenage sons Cole and Taro. With a simple set-up, they transformed it into an outdoor movie-screening space. As movie night took off, the neighbors started to join in. Sinking into the cushy sofa with lanterns lit overhead, guests watch The Birds or The Sound of Music on a screen nearly as big as the garage wall. “In the summer, every Friday is movie night,” says Houston. 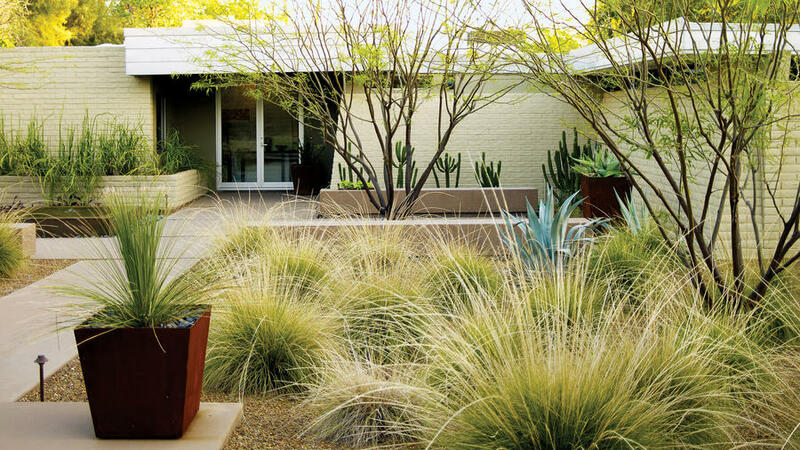 A scruffy lawn and an oddly configured walkway do nothing for this Phoenix house–the yard is wasted space. 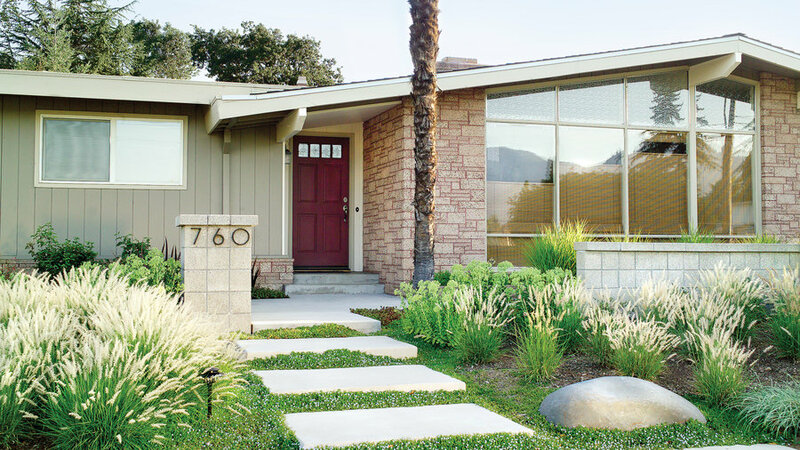 They replaced the lawn with drought-tolerant grasses, then added young trees and a paved area beside the front door. Lawns require an inch of water a week to maintain during the growing season. 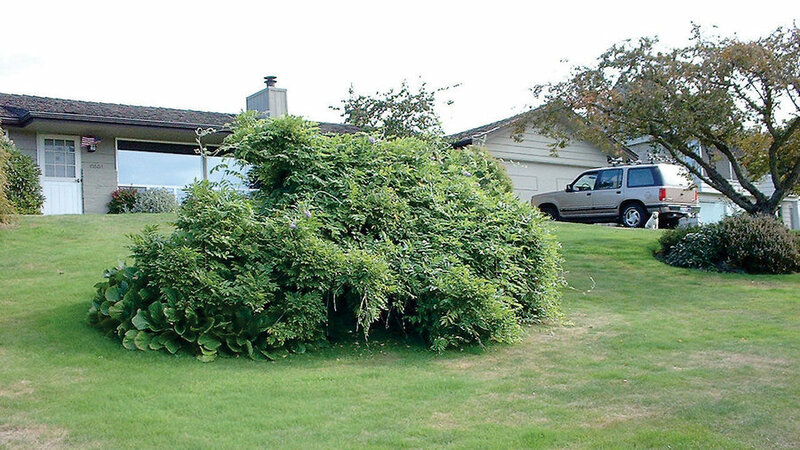 And except for a big clump of overgrown wisteria, this large Seattle front yard was all grass―a real water hog. Landscape designer Stacie Crooks knew it had to go. Now Crooks’ front yard stops traffic. Instead of lawn, she has a large mixed border. It includes evergreen shrubs like Ceanothus and Viburnum, grassy foliage plants like Carex and Phormium, and tons of perennials, including asters, penstemon, and euphorbia. 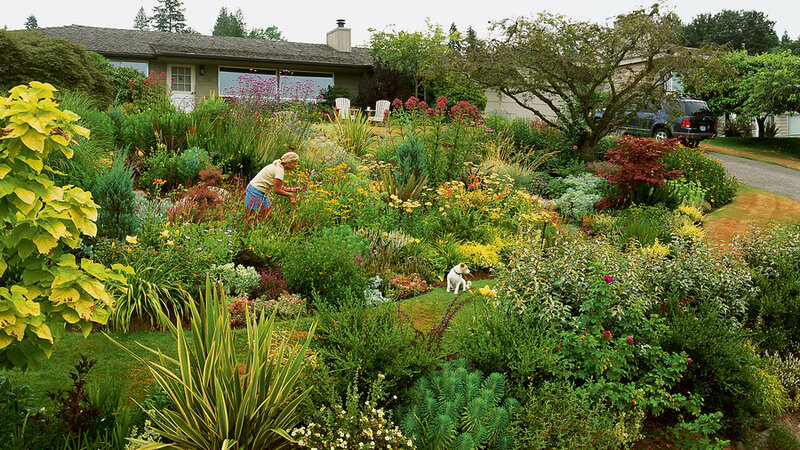 Best of all, this extravaganza of plants requires less than one-half the water the lawn needed. Summers are hot in Grants Pass, Oregon, and a front yard that is mostly rocky mulch makes them feel more so. 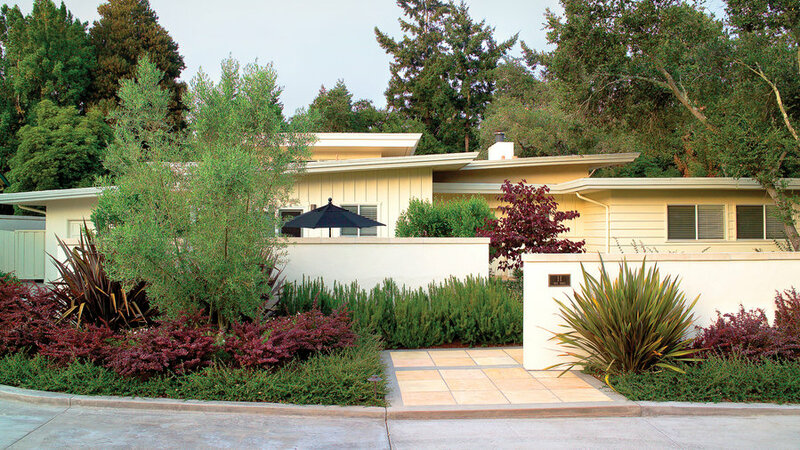 When homeowners Ken and Beverly Behymer bought their house, they asked landscape architect Jim Love to make the space feel cooler but without causing their water bill to spike significantly. 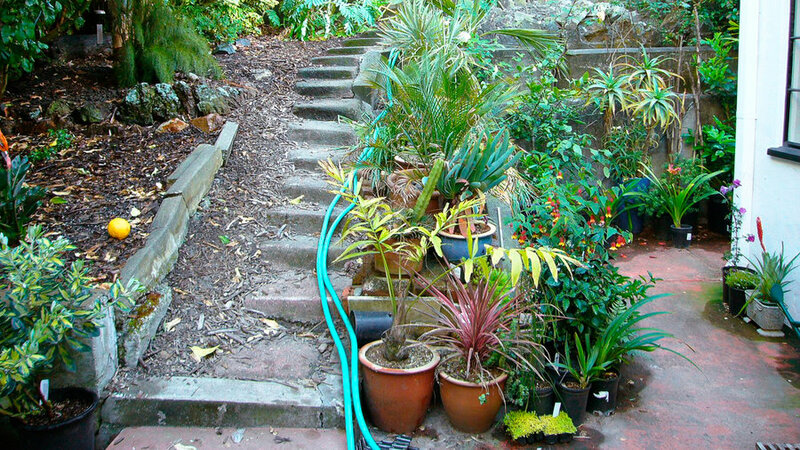 A variety of plants with low water requirements replace the former sterile expanse of rocks. They are all heat-tolerant and were chosen to provide year-round interest. Oriental fountain grass (Pennisetum orientale), in full plume here, is one of the garden’s stars. Behind the low wall, flame grass (Miscanthus sinensis ‘Purpurascens’) is just beginning its transition to brilliant orange fall color. Between the pavers, adding a touch of coolness, is ‘Red Carpet’ sedum. 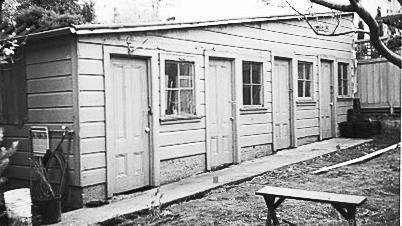 The pair of 6-foot-tall concrete walls that now enclose the front yard shelter an outdoor dining area. The dining alcove was placed here because this spot is west-facing, and warm and sunny is a good thing in the home’s chilly, coastal climate. The staggered walls provide room for generous planting pockets for green and burgundy foliage plants. 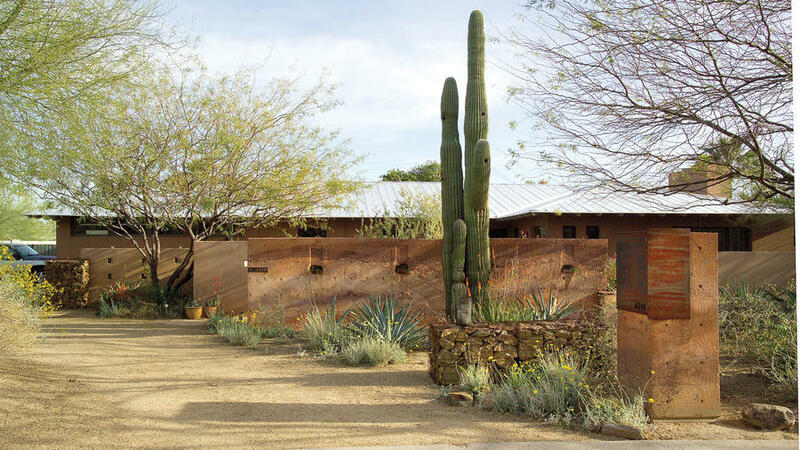 Before the remodel, the couple’s front yard was a sea of gravel surrounding a single saguaro cactus. What’s more, the space offered little in the way of privacy. The homeowners carved out a spacious front yard courtyard and screened it behind a series of staggered walls. There’s the craggy-textured cast-earth wall pictured here, plus two flanking walls of smooth stucco, which provide contrast. A lower wall of gabions (stone-filled wire cages) adds more texture. And now that it has agaves and desert perennials for company, the agave looks more at home. 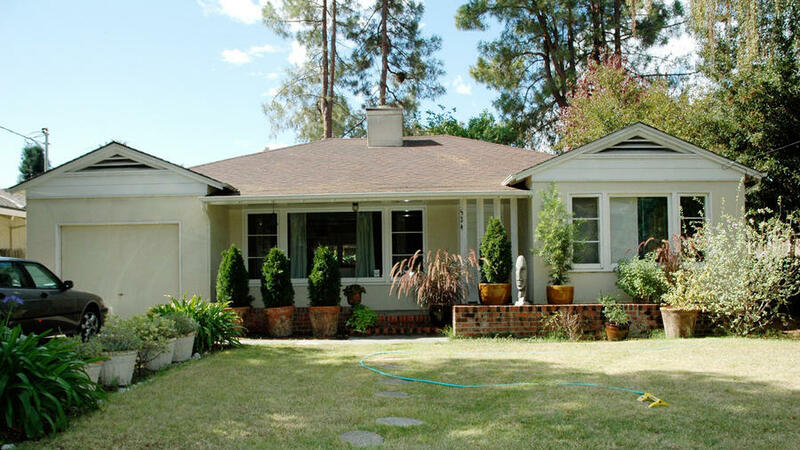 Hidden from the street behind the sheltering walls is a comfortable space for relaxing and entertaining alfresco. It’s ample enough for two separate seating areas plus a dining space. 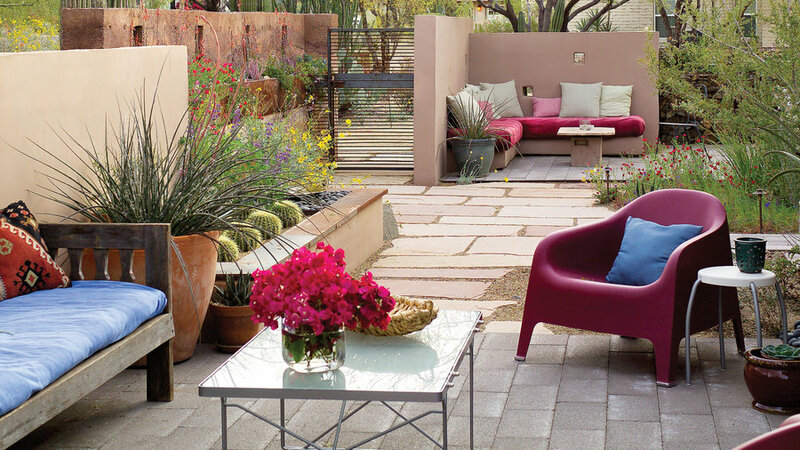 Plant-filled raised beds add texture, while furnishings and accessories provide pops of color. This family’s only outdoor space was a lifeless rectangular parking pad of concrete, gravel, and asphalt next to their busy street. 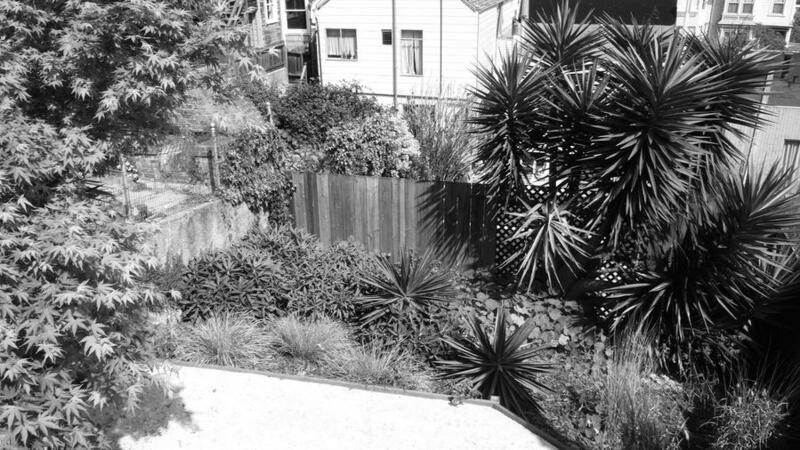 There was no fence for privacy and no plants to soften the landscape. Now it’s a courtyard for summer dining and entertaining. Fencing across the back of the driveway creates a private 33- by 25-foot outdoor room paved with Pennsylvania bluestone. Greenery and a garden shed creates a sheltering screen. 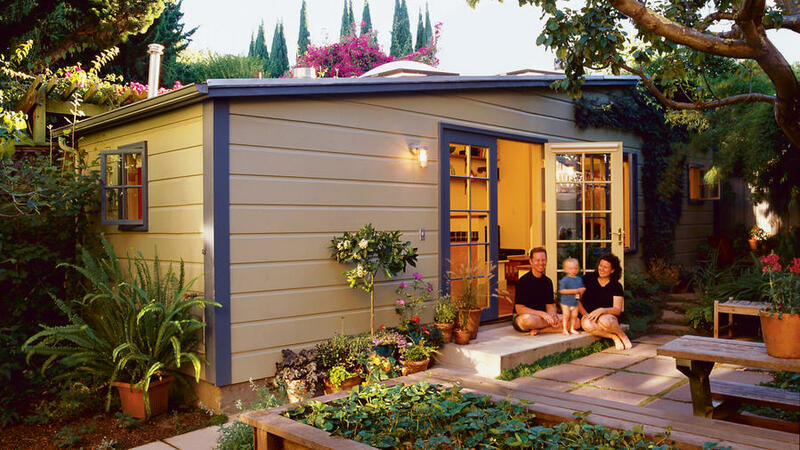 Evan Sagerman and Marci Riseman found space for this guest suite and entertaining area in an unlikely place: a tiny, ramshackle shed in the backyard of their San Francisco Victorian home. 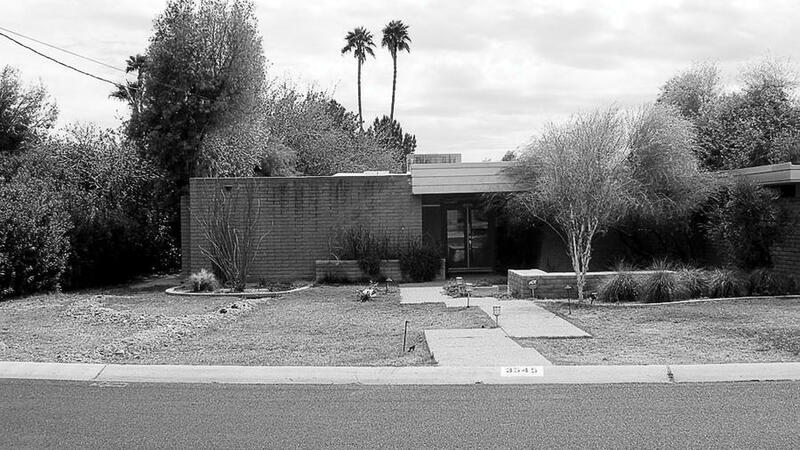 The makeover became an exercise in preservation and space planning. 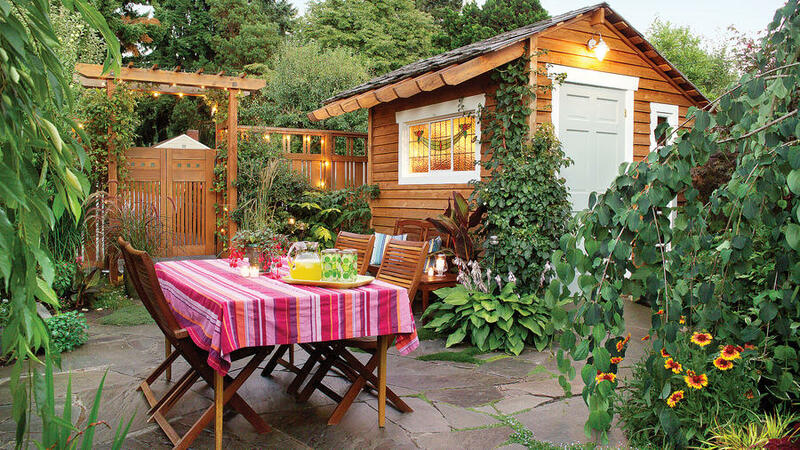 The interior of the backyard shed has a clean, open layout, inspired by boat cabins. 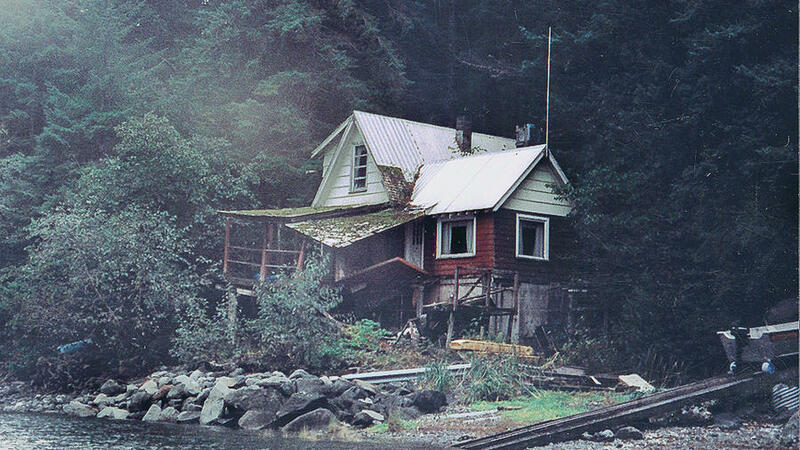 Abandoned for six years, this Alaska cabin was a dump. Its previous owners had left behind moldy bags of clothes and thrown out their furniture in the yard. The porch had collapsed, the basement walls had rotted, and a hemlock tree was growing through the roof. 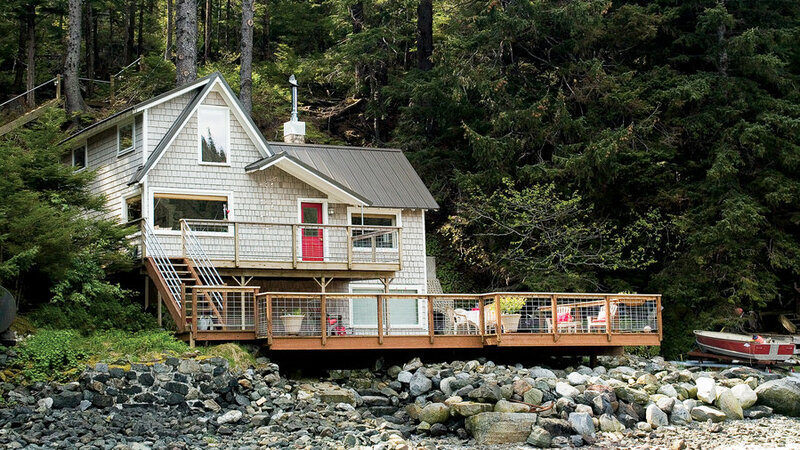 Apart from the basement, the house measured only 740 square feet―and the only access was by boat or by hiking down a half-mile trail. 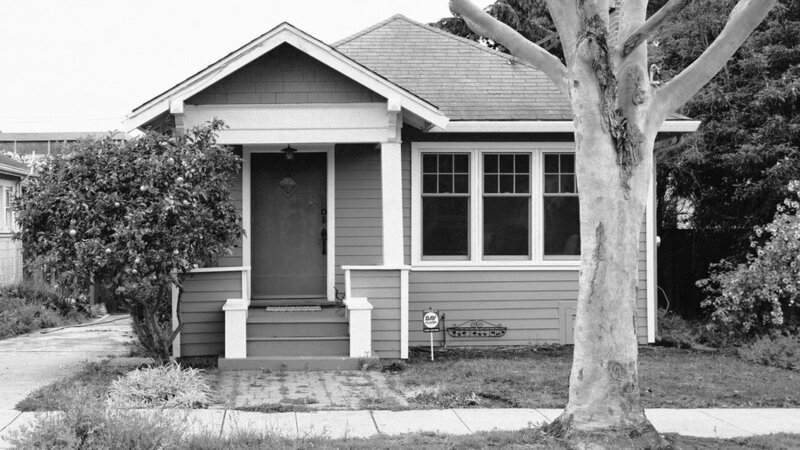 After a monumental cleanup, the young homeowners ripped off the hazardous porch and re-plumbed the house. They took out walls and stripped the kitchen and bath down to the studs. Western red cedar shingles replaced the rotting siding, and the front door was painted crimson. Now the revamped cabin makes the most of its small scale.